The marinade really is the superstar of this dish. Chunks of chicken breast are infused with a delicious marinade of garlic, balsamic vinegar, olive oil, lemon juice and a handful of dried herbs. Having the chicken marinate overnight fully ensured each bite was bursting with flavor. But it doesn't stop there. I served this with homemade pita bread, which we grilled and brushed with a garlic butter. The pita was then topped with lettuce, tomato, sliced red onion and tzatziki sauce. We removed the chicken off the skewers and added them to the pita, which we ate gyro style... and boy, it was amazing! I told my husband that there was no need for us to trek to Chicago's Greektown now that this recipe was in our hands! In a small bowl, combine all the ingredients except the chicken. Pour marinade into a large resealable plastic bag. Add the chicken to the bag and seal. Refrigerate overnight for chicken to absorb the marinade. 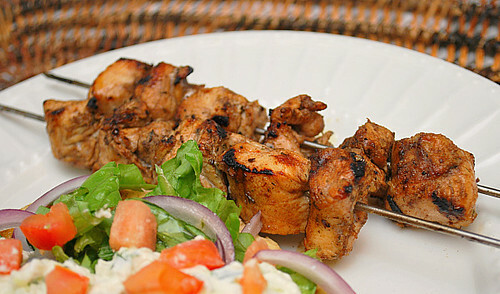 Remove chicken from marinade, skewer and place on prepared grill. Discard remaining marinade. Cook chicken until juices run clear, about 5- 8 minutes on each side. 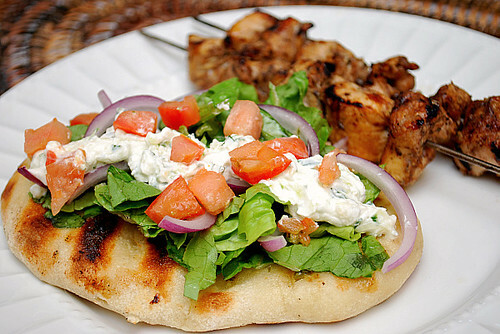 Remove chicken from heat and serve with pita bread, lettuce, red onion, tomatoes and tzatziki sauce (recipe follows). Place the chopped cucumber in a tea towel and squeeze to remove the liquid; discard liquid. In a medium mixing bowl, combine the drained yogurt, cucumber, salt, garlic, olive oil, vinegar, and mint. Serve as a sauce for gyros. Store in the refrigerator in an airtight container for up to a week. Yield: 1 1/2 cups. If you use greek style yogurt, can you skip the straining, or do you think it is critical? Aimee - I thought the same thing but if I were to use Greek yogurt, I think the tzatziki would still be too 'loose'. I really like how thick it came out as a result of straining the yogurt. Just dropped by to tell you that this recipe is awesome. I tried it a few days back and though I changed a few of the ingredients (http://wp.me/p16Pg2-7z), the end result was heavenly. Thank you so much for posting this recipe.